We’re delighted to have one of our most popular singer/songwriters and a cornerstone of the Edinburgh music scene return to Acoustic Edinburgh for a headline slot this month. Alan Davison recently released his debut solo album, White Eagle Lounge, after a decade of performing with a breathtaking range of musicians and acts. It’s a mark of the respect that Alan garners among fellow musicians that he brought together more than 35 performers to work on his album with him, including Nathan Connolly and Tom Simpson from Snow Patrol, singer/songwriter Alex Cornish and Rick McMurray from Ash. the real beauty in ‘The White Eagle Lounge’ lies in … a surprisingly diverse and enchanting series of songs … My lasting impression of ‘The White Eagle Lounge’ is its sense of sonic exploration through collaboration. Davison’s willingness to experiment with instrumentation and vocal arranging, to include employing a slew of guest musicians, doesn’t override his keen musicianship or the solo nature of his work. To round out the night, we’ll have fantastic short sets from The Fearless Divide, Hannah O’Reilly and Scott Cowie. What better way to try and come to terms with the start of the new Ice Age than spend a few hours in a warm basement bar in the company of these lovely musicians? This month, we’re delighted to have the chance to get the celebrated up and coming singer, Caroline Gilmour, and her band down to the Jazz Bar as they take a quick well-earned break from recording her follow up to last year’s EP, “What Georgina Said”. Joining Caroline this Thursday will be Hayes Peebles, Mike Macfarlane (stepping out from behind the mixing desk! ), and Becca Fox. Should be a great night of wonderful music. We’re back on the 7th for our Feb event featuring one of Edinburgh’s most respected songwriters – DOUGLAS KAY. He’ll be playing songs from his new album “Last Touch“. We’re equally excited about a mind-bendingly good bunch of support acts: TOM MCCONNELL, GREG PEARSON, and US based artist LIZ LAWRENCE who we’re lucky enough to catch on UK tour. An unmissable night of live music! It’s the Acoustic Edinburgh Hogmanay Hangover special event! Each year, a random assortment of Edinburgh’s finest musicians get together for a special Acoustic Edinburgh, where everything is a little bit more relaxed – some might say shambolic. Expect musical humour, unexpected turns, and the occasional ludicrous cover version. We’re never entirely sure who’ll turn up, but we’ve got a headline from the wonderful SCATTERBRAIN, an Acoustic Edinburgh debut from the banjo-wielding VANESSA FERDINAND, as well as musical fireworks to match the best you’ll see in the sky tonight from the likes of MARTIN PHILLIP, ROB HOWELL, and PAUL GILBODY. WHO: A cast of many! Well, that went by quick. There’s a chill in the air, the tree is up in Jenners, and the fear in the eyes of the shoppers is palpable. But more importantly, it’s the last Acoustic Edinburgh of 2012! But when it’s cold outside, what you really need is something to warm your soul, and what could be better than placing you in the capable care of Findlay Napier and the Bar Room Mountaineers ? With an irresistible honesty, charismatic vocals, and brilliant contemporary folk songwriting, Findlay and his band will be rounding off an excellent night of music, and an exciting year for Acoustic Edinburgh. I hope you can join us! One of my all time favourite performances at Acoustic Edinburgh was back in 2008. That was the first time I’d heard JO MANGO play and she completely floored me with her luminous vocals, uncanny lyricism, and complete mastery of the kalimba, concertina, omnichord and shruti box. Since then, her song Black Sun may well have become my most played iPod track. I’ve been waiting impatiently for the album that song is on to be finished and now it finally is. We’re hugely privileged to announce that Acoustic Edinburgh will be the first place to buy that record, Murmuration, as she headlines for us on Thursday 1st November. You can grab the first single off that album for free here, and please do watch the beautiful new video for Black Sun! If you want to find out more about what makes Jo tick, check out this interview with her at Famemagazine. As well as being a Dr of musicology, she has a stellar line-up of collaborators including Vashti Bunyan, Vetiver, Devendra Banhart, Adem, Teenage Fanclub and David Byrne. She even stars as “Herself” in the movie, You Instead, which had its TV premiere a couple of weeks ago. As you can probably tell, we’re super excited to be welcoming Jo to our wee stage in the Jazz Bar. Don’t miss it – the next chance you’ve got to see her in Edinburgh will be in the much less intimate setting of the Queen’s Hall next year! The time has come at last to move to a new venue, a new regular slot, and a new decade of exceptional music. Come and celebrate our relaunch at the legendary JAZZ BAR on Chambers Street on THURSDAY 4th OCTOBER, just round the corner from our old venue. The new home for Acoustic Edinburgh has a well deserved reputation among musicians and music fans alike for being a mecca for those who care about live music. To use an old cliche, it actually is run by musicians, for musicians. We’re delighted to be moving there! We really wanted our first headline to be something special, and we think we’ve got the perfect person. LAKE MONTGOMERY has taken a circuitous route to our shores, by way of Paris Texas, San Francisco, St. Louis, New Orleans, and Amsterdam and has been picking up music and stories along the way. When you first listen to Lake, your ears can’t quite believe what they are hearing. She has an extraordinary voice – heaven with just a trace of brimstone – and plays the blues like you’ve always known it should be played but have never heard it done before. I’ve just noticed that this is the 100th post to what I still think of as our new website, and what a happy post it is to be able to write! Having taken some time out this summer, Paul, Damon and I are really excited about what we’ve got planned in the next few months. I can’t think of a better way to restart than with a very rare visit to Edinburgh from the quite breathtakingly brilliant POLLY PAULUSMA. I mean that literally. If you haven’t already had the pleasure of hearing Polly’s music, it’s the sort of experience where you have to make a conscious effort to remember to breathe. Her songwriting and vocal delivery have a luminous quality that draw you in to her stories of life’s tragedies and joys. 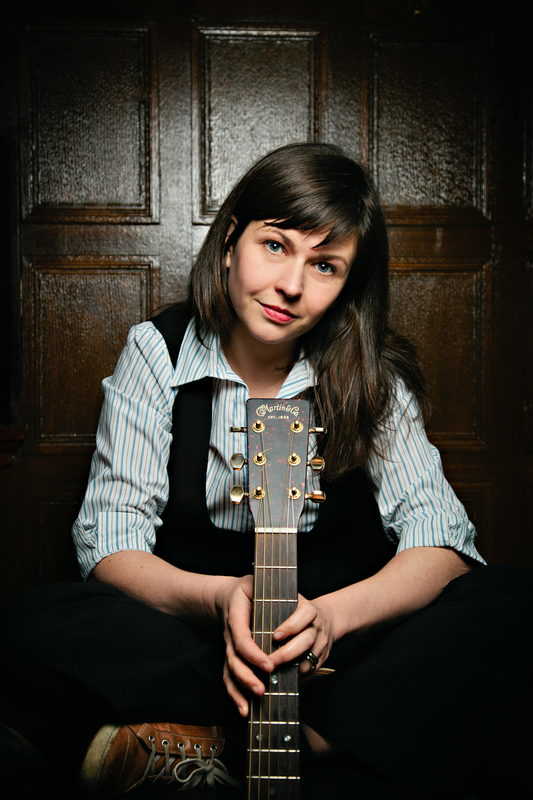 She’s coming up to Acoustic Edinburgh as part of her UK tour, promoting her wonderful, celebratory third album, Leaves from the Family Tree (which includes guest appearances from Adem, and Erin McKeown). Because it’s not every day you get a chance to play host to someone like Polly, we thought we’d make a special occasion of it and move our night to Saturday. It promises to be a genuinely magical evening. Paul and I have been running Acoustic Edinburgh for over 10 years now, and we’ve decided we want to make some changes because, well, we don’t want you to think we’re stuck in a rut or anything! Because of this, Acoustic Edinburgh will be taking a break over the summer, and returning with an all new regular night in the autumn. We’re going to be moving days and venues for our monthly event. Instead of Tuesdays in the Third Door, we’ll be on Thursdays at the wonderful Jazz Bar on Chambers Street. We’re really excited about this, because the Jazz Bar has been at the forefront of promoting live music in Edinburgh for years now and is a great music-centered venue that’ll be the perfect fit for Acoustic Edinburgh. So, please do join me, Paul and Damon on October 4th for what will be a very special relaunch night. We’re not leaving the Third Door behind, however. We think that venue is going to grow into an important part of the Edinburgh scene, and hope to have a lot of one-off events in there. The first of these is going to be an evening with the incomparable Polly Paulusma on Saturday September 1st. In the meantime, if you’re looking for live music both Paul and I have some gigs coming up in the Festival, and it would be lovely to see you there. Paul is playing on the 12th, 19th and 24th August in the Jazz Bar, and I will be taking my robot band, #UNRAVEL Live to the Queen’s Hall for a night with FOUND and Aidan Moffatt on 15th August. Make sure you get tickets for these events soon! For this month’s event, we were planning to serve festive cupcakes, drape the ceiling with bunting, and enforce an “anthems only” policy for our acts. But then we realised it was still 50 years before the Acoustic Edinburgh diamond jubilee so we’d better just get on with putting on amazing music for you all. Accordingly, we present the wonderful Hercules Mandarin. This fresh, engaging four piece have been clear audience favourites when they’ve played for us in the past, so it’s great to have them back for a headline. They effortlessly bring together a folksy acoustic sound with violin-driven melodies and rockier sensibilities. Perfect end to a long weekend!